It was revealed to the Promised Messiah (on whom be peace): ‘There is no God but Me, so take Me alone as your Guardian.’ [Tadhkirah, p. 626] Here God assured the Promised Messiah (on whom be peace) that he did not have to turn to anyone else, that God alone would make everything work for him, He alone would be the Guardian and He alone would provide all the resources. God reassured that He alone had the power to make good everything and that indeed He would do so. The Promised Messiah (on whom be peace) said that God has stated through this revelation that He alone was the Guardian and the Promised Messiah should not even consider anyone else’s involvement in his work. The Promised Messiah said every member of the Jama’at should be mindful of this revelation in that God is not dependent on any help, service or sacrifice. He has established this community and He Himself will make it work. Whatever way any member is able to serve the Jama’at should be considered as Divine grace. People of the Jama’at at the time understood this and were prepared for every sacrifice for the fulfilment of the mission demonstrating high ideals of financial giving. They did not consider the sacrifices they made any kind of favour, rather they were grateful to God for enabling them to make the sacrifices. This spirits lives on today. This revelation also indicates to the Khilafat that followed the Promised Messiah that owing to the spirit of man’s devotion to God, help should only be sought from God. Today we continue to experience Divine help and grace. God places the significance of financial giving in Ahmadi hearts and they demonstrate extraordinary models of the same. There are various financial schemes in the Jama’at one of which is Waqfe Jadid. Waqfe Jadid has expanded greatly and shows some amazing examples of financial giving. This scheme was initiated to support tarbiyyat and tabligh efforts in rural and far-off areas of Pakistan but was later extended to the rest of the world. It still has specific objectives and certain areas/regions are designated to benefit from it. As such only specific countries and regions are funded by contributions raised by Waqfe Jadid. Generally it is African countries and rural areas in India where Waqfe Jadid is funding many projects. With the grace of God the 58th year of Waqfe Jadid concluded on 31 December 2015 and the contributions made during the year stand at £ 6, 891,155 which is an increase of £682,000 from last year. Pakistan tops the list of contributing countries. A third of the contributions received by Waqfe Jadid is spent in the countries where it is collected. One portion of the remaining two is spent in Qadian and the rest of India and the remainder in African and some other countries. In the last year 19 mosques were built in India funded by Waqfe Jadid as well as 23 mission houses. Expenses of Jalsa Gah in Qadian and other projects were also met. Two mosques and two temporary sheds were built in Nepal which is administered by Indian Jama’at. Special focus is given to building of mosques and mission houses with Waqfe Jadid contributions. Expenses of mu’alims (religious teachers) are also met by this scheme. For example there are over one thousand mu’alims in India and in 26 African countries as well the number of mu’alims is over one thousand. 130 new mosques and 82 mission houses were built in the last year in African countries. Extensive Tarbiyyat classes for new Ahmadis are held in African countries. Last year over 2000 such classes were arranged and numerous refresher courses were held in which one hundred thousand new Ahmadis participated. 600,000 people worldwide had participated in the Waqfe Nau scheme in 2010. At the time Hazrat Khalifatul Masih had counselled that financial giving was an integral part of tarbiyyat and had encouraged to increase the number of participants. With the grace of God, in 2015 the number of participants was in excess of 1,200,000. 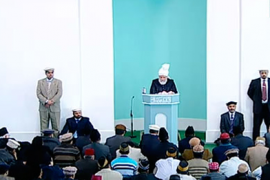 Huzoor said there is room for improvement yet in this regard. Next Huzoor related many faith-inspiring accounts of financial giving from African countries, Finland, India, Mauritius, Australia, Norway, Germany and Canada. In 2015, in terms of contributions, after Pakistan, the first ten countries were as follows: UK, USA, Germany, Canada, India, Australia, Indonesia, a Middle Eastern country, Belgium and Ghana. As regards increase in contributions based on local currency the first three countries were: Ghana, USA and UK. As regards per capita contributions the first few countries were: A Middle Eastern country, USA, another Middle Eastern country, Switzerland, UK, Australia, Belgium, Germany and Canada. In terms of increase in contributors, apart from Africa, following were the main countries: India, Canada, UK and USA. In Africa, where the most significant increase in contributors took place, these were the main countries: Nigeria, Cameroon, Guinea Conakry, Niger, Burkina Faso, Mali, Benin, Tanzania and Uganda. The first three Jama’ats in Pakistan in terms of adult contributions were: Lahore, Rabwah and Karachi. The main regions/districts were: Faisalabad, Islamabad, Sargodha, Gujranwala, Gujrat, Multan, Umerkot, Narowal, Hyderabad and Bahawalpur. The first three Jama’ats in Pakistan for Atfal contributions were: Lahore, Karachi and Rabwah. And the districts were: Islamabad, Faisalabad, Gujranwala, Gujrat, Hyderabad, Dera Ghazi Khan, Multan, Kotli, Mirpur Khas and Peshawar. In UK the main Jama’ats were: Worcester Park, Raynes Park, Birmingham West, Fazl Mosque, Wimbledon Park, Gillingham, Cheam South, New Malden, Bradford South and Glasgow. The main regions in UK were: Midlands, North East, London A, London B and Middlesex. The main Jama’ats in USA were: Silicon Valley, Seattle, Detroit, Central Virginia, Los Angeles, Silver Spring, York, Harrisburg, Boston, Houston North and Dallas. A few of the main places in Germany were: Hamburg, Frankfurt and Wiesbaden. The main three places in Canada were: Calgary, Vaughan and Vancouver. While the main five Jama’ats were: Milton – Georgetown, Durham, Edmonton West, Saskatoon North and Ottawa West. As regards contributions of Atfal the first few Canadian Jama’ats were: Durham, Calgary North West, Milton – Georgetown, Peace Village East and Woodbridge. Hazrat Khalifatul Masih said he has previously drawn attention as well that other countries with large Jama’ats should also work on the lines on which organised work is done in Canada for Waqfe Jadid for Atfal. Huzoor explained that while there is Waqfe Jadid for Atfal there is no separate department for Atfal in Tehrike Jadid. The main districts/regions in India were: Kerala, Tamil Nadu, Jammu Kashmir, Telangana, Karnataka, West Bengal, Orissa, Punjab, Utter Pradesh, Delhi and Maharashtra. The main Jama’ats in India were: Kerala, Calicut, Hyderabad, Pathapiriyam, Qadian, Kannur Town, Calcutta, Solor, Bangalore, Gadi and Rishinager. In Australia, these were the main Jama’ats: Melbournne South, Castle Hill, Mount Druitt, Adelaide South, Lambton, Brisbane South, Logan, Marsden Park and Blacktown. May God bless the contributors and grant them more and may we be able to make bigger sacrifices this year in terms of contributions as well as contributors. Muhammad Aslam Shaad Mangla Sahib who passed away on 31 December 2015. He was almost 71 years old. Ahmad Sher Joya Sahib who passed away at the age of 67. He lived in Belgium.